A KMSP-TV reporter arrested Saturday has been charged with gross-misdemeanor drunken driving and leaving the scene of an accident, according to a complaint filed in Hennepin County. Beth McDonough was also charged with careless driving. She had a blood-alcohol reading of .24 percent two hours after troopers showed up at her Minnetonka home, the complaint said. That reading is three times the limit used to determine drunkenness in DUI cases. She refused a blood-alcohol test at first but later consented. 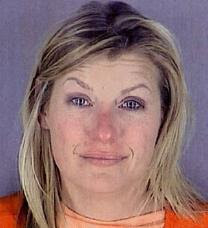 McDonough, 40, had her driver's license revoked in December after she was convicted of third-degree drunken driving. Her license was reinstated in June. The driver of the other vehicle involved in Saturday's accident said he called authorities and then followed the car as it drove away after it rear-ended him on Interstate Hwy. 394 near Hwy. 169. A State Patrol trooper went to McDonough's home and noticed "a strong odor of an alcoholic beverage, slurred speech, and bloodshot and watery eyes," the complaint said. KMSP-TV news director Bill Dallman said McDonough has been suspended. McDonough was booked into Hennepin County jail and released Saturday afternoon after posting $12,000 bond. She is due to make her first court appearance Dec. 2.